A well known F1 twitter individual commented following yesterdays driver press conference, that he thought there was no contradiction by Alonso of his team’s position on the crash in Barcelona testing. My recommendation is that this individual start reporting on bowls. Yesterday was dynamite. The prodigal son who shipped McLaren to the FIA costing them a $100m fine for cheating in 2007, returned to trackside ready to race once again for the Woking team. At the Fernando Alonso road show that was the FIA conference, the Spaniard looked relaxed and confident despite the whirlwind start to his season. Notably, Alonso was most particular in what he had to say, and it is clear the Fred/Big Ron love – with which we were presented when the Spaniard was revealed as the Woking team’s new signing for 2015 – is gone. So the first question is, why was Alonso airlifted to hospital following a relatively low speed crash in which he was not rendered unconscious? Neither driver nor the team have provided anything remotely satisfactory as an explanation. As we know, Alonso was not just driven to hospital for a check up, but was admitted to intensive care and spent three nights under medical observation, before the doctors were content to release him. 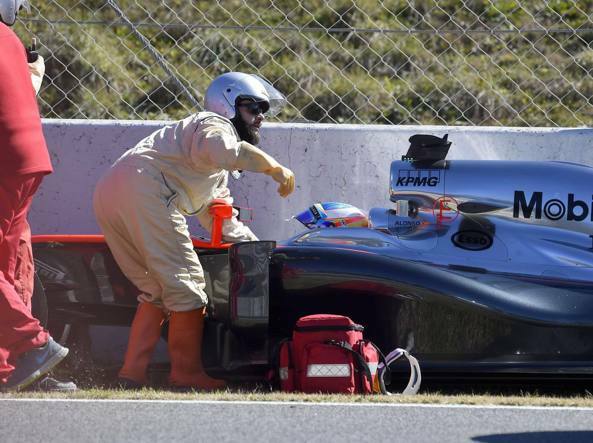 Whilst Fernando was undergoing the medical supervision in Spain, McLaren were stating, this was “a normal testing incident” and that the car was in no way at fault. One of the explanations offered by McLaren was, that on the day of the crash the wind was gusting heavily and it may have destabilised Alonso’s car causing him to lose control. Fernando could not have been more categorical, almost to the point of ridicule, in his rejection of McLaren’s ‘wind’ explanation. “Even a hurricane would not move the car at that speed. Also if you have any problem, medical issue, normally you will lose power and go straight to the outside, never to the inside. That’s one thing”. James Allen revealed on Radio Five lives, “Behind the scenes, there’s a certain friction between them [McLaren and Alonso], Alonso’s not happy with the internal report that was put together, where McLaren insisted there was nothing wrong with the car. But he [Alonso] is saying there definitely was because the steering was a problem”. McLaren were asked whether they now accepted the car was at fault, they refused comment. However, the team did respond by again wheeled out Jenson Button to give his expert opinion on the matter. “I’ve looked at the data and I’m happy to drive the car,” Button said. “My view hasn’t changed on that’. The Brisish world champion backed McLaren to the hilt. “We have a lot of sensors on the car and this team is very experienced in incidents and they – as with every team in Formula One – take every precaution possible in terms of safety. So Jenson says – not a car fault. The implication being it was a driver error. Yet he left his new team in no doubt whatsoever as to his position that the car was at fault adding, “I have zero doubt”. McLaren would have hoped the return of a fit and healthy Fernando Alonso this weekend would put to bed the mystery surrounding what should have been a fairly innocuous incident in Barcelona. The reverse has happened. Why Fernando is deliberately creating “friction” within the team is for now a matter of speculation. One theory would be, those within Woking who were opposed to signing Alonso are fighting some kind of rear guard action in an attempt to get the Spanish driver sidelined permanently on the grounds of long term medical doubts. This story is not yet over – and it will rear its head again when the FIA publish their findings into the incident. There was always the theory that Senna’s was Honda’s favourite son and Prost was McLaren’s. And who wanted Alonso back at McLaren? Honda? And which line does Button walk? McLaren’s? For one thing though (and I can’t believe I’m saying this), I’m on Alonso’s side on this. If there truly was a problem with the car, why admit that he’s at fault? Just to appease Ron? In any case, it seems that the battle lines have been drawn. But we won’t see much action because Macca is only fighting the Manors for now. If they were challenging for wins though, awesome, noone would care about the championship, only for Fred vs Ron, round 2. Even Mayweather and Pacquiao would gets seats for that! didn’t ron side with senna when it came to the pole position in suzuka and later the crash with prost and sennas disqualification? or was that because by that time prost had already signed with ferrari? For love god, will someone just stick him in a Williams it close and enough on pace for him to mount a title challenge and Frank wouldn’t take any of his rubbish and itd just work. yes, if he had been smart he would have offered his services to any mercedes powered team. i think there was a rumor last year that he was looking at lotus, even with an option of buying into the team. he could have performed some of his magic there and maybe even challenged for wins, instead of battling for positions at the end of the grid. mclaren looks like the end of the road for alonso, i’m quite certain that relationship will deteriorate and that alonso won’t be driving for them by the end of the season. he didn’t really want to sign there, ron didn’t really want to sign him and their history is already charged. add a crap car into the mix, and you have an epic meltdown in the making. and that doesn’t even take account of the mysterious testing crash. I think you spell report “summary”, Lol! Shorter FIA “A Thing Happened. We hope it won’t happen again, and it’s like, totes not our fault”. So to me he’s somewhat saying that Mclaren are hiding vital information from him and the media. I asked this question just now in the DN&C that I think was vital to all this. Why did he switch off the radio immediately after the crash? Alonso’s “memory” of the entire event are odd in that they fly in the face of the reactions of the marshals and the first emergency responder to the scene. Alonso appeared wholly unresponsive and the marshals, after approaching Fernando and, seemingly, attempting to communicate with him/assess his condition, to a person, kicked into emergency mode. I don’t think this happens if Alonso is aware and responsive as he claims he was. And yet. He does seem to early remember what took him off the track in the first place. My first thought, believing Alonso’s memory of the event, is that he likely was disgusted about his steering – lack of – and didn’t want to hear a voice from the McLaren box. But, again, the post-crash videos seem to show he was immediately in bad shape. Perhaps he managed to instinctively accomplish this task(?). Peripherally, but related… I also find it odd that McLaren summoned photographer Alessandro Salo to their box to review his photos of the crash. With the telemetry at hand, why would they need photos, unless they were immediately thinking about controlling the discourse surrounding the accident. 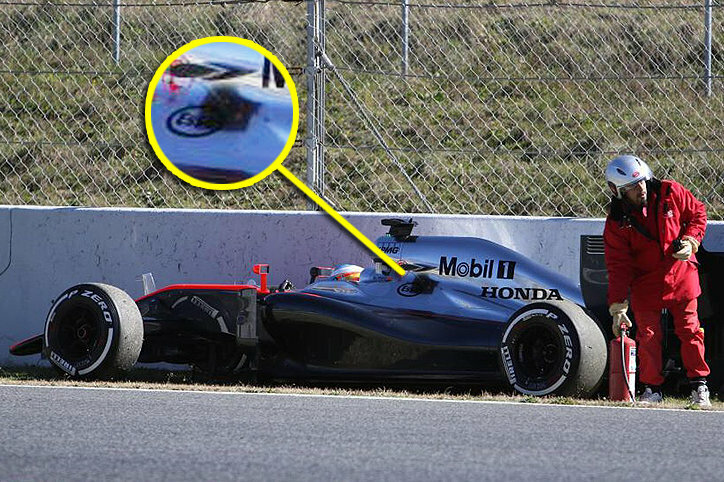 And what of Jordi Vidal’s post-crash photo and before anyone arrived at his car, showing a clear burnt spot on Alonso’s car on the “Esso” sponsorship livery?! I agree with most of what you say, especially the first part relating to why Alonso needed to be extracted from the car. I am also sure that brain experts/doctors will confirm that Alonso’s memory of this incident cannot be relied upon. There is one point I do question – you say “showing a clear burnt spot on Alonso’s car on the “Esso” sponsorship livery”. Thanks for the clarification on that spot – great work. I admit, I took Vidal’s photo at face value (perhaps that’s why he, too, wasn’t called to McLaren’s box – :-)…). Actually there’s a switch on the chasis right in front of the cockpit that’s there for the marshalls to use, so as to isolate the MGU-K if the driver is incapacitated. This whole thing seems like an episode straight out of the X Files. True. Yet another reason to dismiss Alonso’s “memory” of the event. Anyone… any thoughts about McLaren calling Salo to their box? I haven’t ever heard of such a thing. Reviewing existing video afterward, yes, but calling a photographer up immediately after a crash? Seems fat from the norm. This makes a lot of sense, precisely because no video was available. Look at it like this: imagine you’re a Nameless GP F1 team and your driver has just had a crash in a private testing session, and was airlifted for health reasons. There was no video footage available of the crash, but some identified bloke took some pictures before and after the crash. Wouldn’t *you* want to review the only shreds of photographic evidence available? I know I would! I take that to mean that he thinks with today’s technology it was not possible to pinpoint the problem, but that in ten years time advances will have been made that enable such incidents to be fully captured and understood. I am inclined to believe McLaren on this story, and I think Fred is doing usual obfuscation stuff. He had ample opportunity to put a stop to all the stories about him thinking he was a Ferrari driver and speaking Itlaian, or that he was back in 1995. Intrigue and controversy around Alonso? Shocking. Author might want to do a spell check. Noticed two glaring ones. Sure. Send me the logon and password and I’ll go in and fix it myself when I spot them. Answer: The FIA sensor was triggered due to greater than 25G hit, and the trackside driver examination revealed symptoms of concussion. Despite The Judge’s fictionalized statement here, what is clear is that McLaren did NOT refuse to accept this could have been a failure in the car. Not only did McLaren not say that, but their actions indicate the opposite. 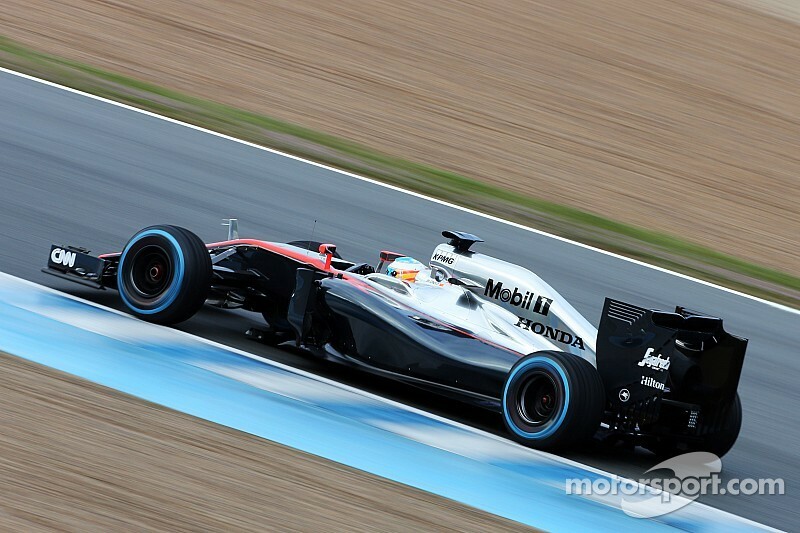 McLaren changed the steering system in Alonso’s car to different components. And McLaren have stated they added an additional sensor. If had McLaren refused to accept it was a car failure, they would’ve said so, and they would NOT have taken the actions which they have since done. 3) Jenson was aware of McLaren’s analysis, and steps to determine the cause and prevent a problem from re-occurring. This article appears to be rather poorly crafted attempt to make a mountain from a molehill. I agree with all you say above. Why did he not put an immediate stop to all the nonsense it( being 1995, him being in Ferrari and speaking Italian) as soon as it was printed? He says he was conscious – then why did he not attempt to get out of the car? Until I see a full timeline of the events published by the FIA, I cannot give much credence to the story as remembered by a driver who has been through a memory loss event. Yeah, that was my first reaction to this piece. 🙂 And I concur with your points above. However, I feel the Judge is making some very subtle and pertinent observations. Fred indeed seems to be playing his usual obfuscation games, and already planting the seeds of discord by subterfuge. It’s almost as if he deliberately inserted confusing statements in the press conf. He says “I don’t know if you see the video but even a hurricane will not move the car at that speed.”, insinuating that there is a video that McLaren have reviewed but decided not to share with the others, when clearly there is NO video footage. Not much mention of it being the fault of Alonso. Perez, Maldonado, Vettel, Schumacher and others, have all gone sailing off the track, when they were adjusting settings on the steering wheel. Imagine how embarrassing it would be, for Alonso to have to admit what happened. New team, new car, partial unfamiliarity with systems, and it looks plausible. If that were the case it would’ve easily been seen by all the team in the data traces. @VM If that were the case it would’ve easily been seen by all the team in the data traces. ….and we’ve all seen the data? Hence the continued speculation, both plausible and tin foil hat variety. Certainly the tin-foil variety at this point.